I’m going to go out on a limb here, buck the trend, and say that Tim Cook has one more “One More Thing…” to throw into the mix. 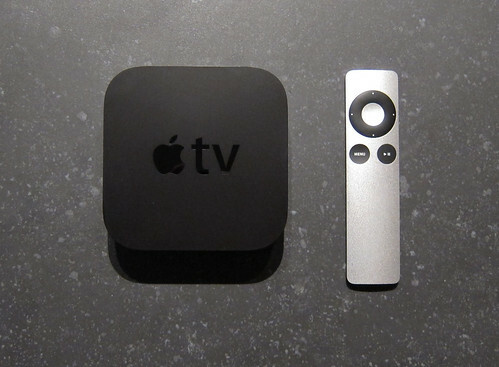 What if Apple is also releasing a new Apple TV type device? Something that’s not just a helper, but more of a “home server” type device (but Apple would never call it that). 1. Apple stopped Apple TV pickup in-stores. They’re still shipping, but they could be reducing inventory. But will the next great thing be Apple’s long-rumored move … into the television business? It’s a market that we have intense interest in, and it’s a market that we see that has been left behind. What can Apple do for television watching? What do you know that is gonna change the game, that we don’t know yet? It’s a market that we see, that has been left behind. You know, I used to watch “The Jetsons” as a kid. I was right there with Elroy. We’re living “The Jetsons” with this. Facetime is “The Jetsons” but television is still television. Ok. Given those two pieces of the puzzle, let me throw out the following. People have lots of “Stuf” on their phones and tablets – photos, videos, etc. Right now, Apple TV allows you to project it via AirPlay. But people are running out of storage. Sure they can “save it to iCloud” (current challenges aside). They can sync with a PC or a Mac – but then the files tend to get “lost” or they’re less accessible. What if a “Home Server” could store this material, easily take it from the phone or put it back, and also back it up to a (more secure, one hopes) iCloud with lots of storage space. That kind of thing is somewhat available now in “Time Capsule” as a backup for your computer. But what backs up your phone and tablet? We already know Apple has a Content Delivery Network (CDN). Sure they’re doing more streaming, they bought Beats and they sell and rent lots of movies. But what if they are also going to store your stuff and get it back to you as quickly as possible? They have a CDN so they want to provide more content. They have content deals. They have your content from your phone and tablet – music, photos, videos, etc. Why not make it easier to get, see and share? This is pure speculation. I have no insider info on this. It just makes sense to me that they want more TV real-estate and they want to keep you in their ecosystem. We’ll see. But if I’m right, I get to do a “Told-ya-so” dance. If I’m wrong, I’ll just keep saving stuff to dropbox.